Please refer to our stock # 1806 when inquiring. 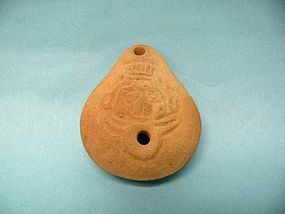 Hellenistic Pottery Oil Lamp with Inscription, ca. 330-63 BCE. Found in the Holy Land. Oval shaped body with design around small fill hole. Design possibly depicts a theatrical mask. Small inscription on reverse. 3 1/8" long and in excellent condition.